Have you met the queen? Her real name is Ghislaine Bazile but she’s affectionately known as the “queen” at the nursing home where she works in North Miami Beach. She earned the nickname because residents at the nursing home say she treats them so well they feel like royalty. 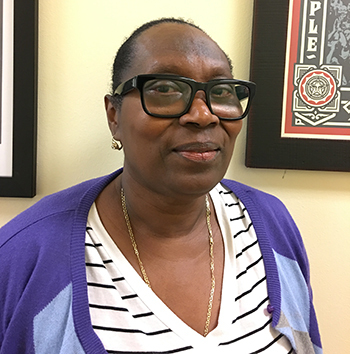 Bazile, who has worked as a certified nursing assistant for the past 20 years, takes pride in her work because she’s providing compassionate care to seniors and other residents. But instead of a queen, she sometimes feels like a pauper because the wages are low. Wage inequality has become a key issue in this election. It’s largely due to the fight for $15 movement which has galvanized workers across the country to demand better pay and respect. Healthcare workers have joined this fight. The average hourly pay for a CNA is just $11 per hour—considerably less than the $19 per hour needed to afford a market rate two-bedroom apartment in Florida according to the National Low-Income Housing Coalition. Other basic living expenses like food and transportation are also high. As a result, low income residents are getting squeezed. Election day is November 6. Early voting starts in a few weeks in communities across the state. Go to 1199SEIU.org/FloridaElection to find the dates and times for early voting in your area as well as information about opportunities to volunteer and help get out the vote for SEIU Florida endorsed candidates.